Here is a list of 10 PGA players you should never bet on to win tournaments on the PGA Tour. You should avoid betting on these 10 players because they rarely win but are often at the lower end of odds in PGA events due to their reputations as great golfers. Make no mistake, all 10 of these players are great golfers but they just don't win often enough to bet on them to win PGA Tournaments. Collectively, these 10 players have won just 18 PGA events in 2,890 starts. That's a combined win percentage of just .6%. You will go broke in rapid fashion betting on these players to win and yet many people do bet on them to win. Interestingly, the 10 players combined have come in 2nd place in PGA events 79 times. That's about five times more than they have won. By coming in 2nd place so often all of these players have earned a ton of money on the PGA Tour and most have earned reputations as great golfers but they are all terrible bets to win. Listed below for each players are how many times they have won tournaments, how many career starts they have, what their win percentages are, how many times they have come in 2nd place and each of their career earnings are in parenthesis after their names. No doubt, some of these players will win PGA Tournaments in the future but those wins are likely to be few and very far apart. If you like betting PGA events it's a big help to be able to toss out some players without thinking about it which this list can help you with. Rickie Fowler is the #1 player you should not bet on because his odds of winning are always too low given how many times he has actually won. Fowler has won just 1.9% of the tournaments he's played on the PGA Tour. This has been well documented by this author before. 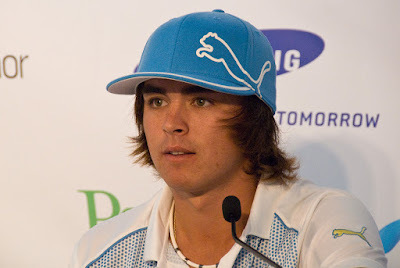 Rickie Fowler is a great golfer but he has seconditis as he has come in second place 13 times in his career vs just 4 wins. With just two wins in 231 starts on the PGA Tour, Paul Casey has a .8% win percentage. Casey has won 13 times in Europe but all that does is push his odds down to levels where you should never bet him to win on the PGA Tour. Casey has 7 second place finishes. Like Rickie Fowler, Louis Oosthuizen also has seconditis as he has come in second place 7 times in 146 starts vs just one career win which came at the 2010 British Open. He's also a great golfer but his win percentage on the PGA Tour is awful (.5%) and you can never get really high odds on him. So far in his PGA career, Kevin Na has won two tournaments in 370 starts for a win percentage of just .5%. Na's first win was in 2011 and his second came 7 years later in 2018. He's still managed to earn some $28 million on the PGA Tour but good luck if you want to try and bet on him to win again. Na has 9 second place finishes. Like Paul Casey, Ian Poulter is a prolific winner on the European Tour (12 wins) but he's only won 3 times in 245 starts on the PGA Tour for a win percentage of 1.2%. Also like Paul Casey, Ian Poulter always has far too low betting odds due to his reputation. Poulter has 5 second place finishes. Charles Howell III has only 2 wins in 517 career starts for a win percentage of just .4%. His last win was in 2007. Bet on him to win a PGA event at your own risk. Despite his lack of wins, Howell is 21st on the all-time PGA Tour money list with $36 million in earnings. Howell has come in 2nd place 16 times which has greatly padded his earnings. Pat Perez did win on tour the last two years, but those were only his 2nd and 3rd wins in 417 career starts. His win percentage is just .7%. Even if you had him to win the last two times, if you had bet him all 417 times he's started a tournament you'd be out a lot of money. Perez has 6 second place finishes. Jason Bohn has 2 wins in 349 starts for a career win percentage of just .6%. Bohn's last win was in 2010. Bohn has 10 second place finishes. Graham DeLaet finished 7th at the 2017 PGA Championship thanks to a great Saturday run including two back-to-back eagles but he's never won a PGA Tour tournament in 176 career starts. Good luck to you if you think he's playing great and is due. DeLaet has 3 second place finishes. Cameron Tringale has never won a PGA tournament in 235 starts. That's worse than Graham Delaet but because Delaet played well in the PGA Championship his odds are going to be lower than Tringale's for awhile making DeLaet a worse bet than Tringale to win a tournament. Tringale has 3 second place finishes.